The Fight for Water: A Farm Worker Struggle tells the story of the water struggle in the California Central Valley through the perspective of two farmers (George Delgado and Joe Del Bosque) who had been migrant farmworkers and whose life's dream had been of being a farmer. They grew up in the fields, went to school, got an education and, after years of hard work, they both became land owners and started their own farming business. For over 25 years they worked the land and hired workers. However, in 2008 an environmental ruling was put in place that shut off their farming water. Consequent, they would no longer farm their land and hire workers, which ultimately affected not only businesses but their community. Because of the ruling, they had to fallow many lands and lay off many workers. Environmental groups had determined that an endangered fish species, which was in low supply and was an important part of the ecosystem in the California delta, needed to be protected from being churned up by the delta pumps. By turning off the pumps, the Delta smelt would be saved, but ultimately it would hurt the down-stream communities that needed water to farm. 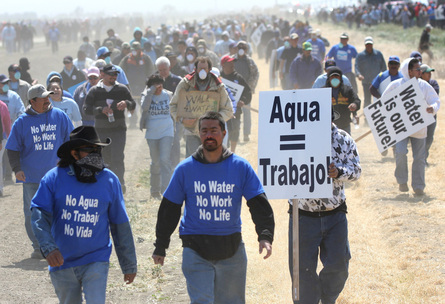 ​To this community of farmers and farmworkers, no water meant no work... and no work meant no food for their families. Donate to help us to continue to make films like these!